Who wouldn’t love a camping trip? Just the mention of the word evokes these most wonderful thoughts…the scent of pine and clean fresh air, sweet gooey s’mores, the soft crackle and snap of wood as the bonfire slowly consumes it, and the cozy warmth of the glowing fire. So take your camping gear out of the closet because we’re invited to Elwin’s first birthday! 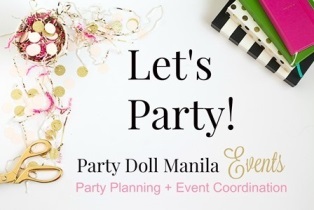 It’s going to be an exciting adventure as Party Doll Manila Events together with the style geniuses from The Party Project Manila puts together the finest birthday camping celebration yet. All the happy details are captured in these brilliant photos by Happy Folks Studio. A perfect camp entrance beckons the guests in. A deer and a cute little bear cub linger just outside among the evergreen trees, grass and shrubs. The ceiling is a “loud fiesta” for the eyes, festooned with blue and white lantern balls, strings of checkered red and white buntings, blue and white fringe banners and lights. The stage is a depiction of the great outdoors with snow-capped mountains in the distance, evergreen trees and the great forest animals. And there on a camping adventure is Elwin, cheerfully standing outside his tent and communing with nature. Sharing the warmth of the campfire are his animal friends – a grizzly bear, a raccoon, a hedgehog, a deer, wolf and fox. The tables are all dressed up in luxurious green fabric with a campfire scene as centerpiece. The other tables are draped with white table cloth and a red and white gingham table runner that mimics the checkered buntings in the ceiling. It’s just amazing how all the design elements come perfectly together. The best seats in the house are reserved for Elwin’s young guests. Throw pillows are arranged around low-legged tables similar to the Japanese chabudai. Tent poles over the tables give the impression of a tent or tepee. Elwin’s three-layer cake by Sugarplum Pastries is simply adorable. Around the bottom layer is a fondant camping scene with Elwin and his friend bear warming themselves by the fire, and a cute doe peeking out the trailer window. The middle layer depicts the hiking trail with a trail sign and camping necessities like a compass and lantern. The trail leads up to the snow-capped mountains at the topmost layer of the cake. The dessert spread at Camp Elwin is like a sweet dream. There are cupcakes with butter cream frosting, sugar cookies, chocolate-covered oreos, marshmallows on a stick and cake pops shaped like raccoons and bears. The children also get to do their favorite camping treat – toasting marshmallows and making their own s’mores. Only the brave and the most adventurous of Elwin’s guests get as close to this albino python as they could possibly get. Looking thoroughly happy, the children are a captive audience as Marcus does his fun games and amazing magic show and members of One Groove Ph do their routine. There isn’t a dull moment at this party! The children get busy in the crafts area, painting and gluing on their own designs on a jar, birdhouse or wooden basket. A game of Snakes and Ladders on a huge board, Jengga and several game booths looks like a lot of fun too. Elwin’s young guests took home some camping essentials – a pillow, a tote to put the pillow in and a drinking bottle. After this cool party, they’ll probably be begging their parents for a camping trip. “Time camping isn’t time spent – it’s time invested” – Elwin’s parents must have thought of this when they planned for this party. And when family time is at a premium, making it happen is worth every effort. Here’s to more happy celebrations for Elwin and his loving family!